Murray Carpenter. Caffeinated: How Our Daily Habit Helps, Hurts, and Hooks Us. Hudson Street Press, 2014. Caffeinated is a surprising exposé of the “caffeine industrial complex,” the industry that markets this substance in every form it can. This book compellingly argues that the health hazards of excessive caffeine intake need more attention and better regulation. I’m convinced. You will be too. The Associated Press says Wrigley’s will temporarily cease and desist trying to market caffeinated gum (see previous post). We hope others in the food industry will exercise similar restraint…. Congratulations to all concerned. It’s good to see the FDA on the job. 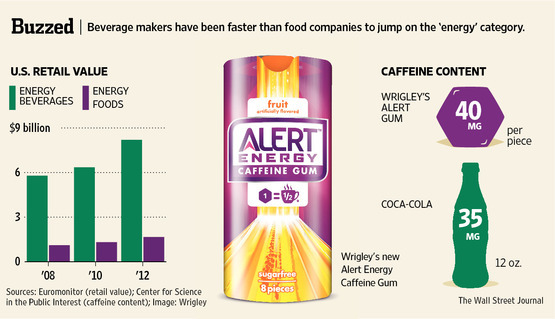 Wrigley, a subsidiary of Mars (M&Ms), announced its new caffeinated chewing gum yesterday in a full-page ad in USA Today. The only time that FDA explicitly approved the added use of caffeine in a food was for cola and that was in the 1950s. Today, the environment has changed. Children and adolescents may be exposed to caffeine beyond those foods in which caffeine is naturally found and beyond anything FDA envisioned when it made the determination regarding caffeine in cola. For that reason, FDA is taking a fresh look at the potential impact that the totality of new and easy sources of caffeine may have on the health of children and adolescents, and if necessary, will take appropriate action. 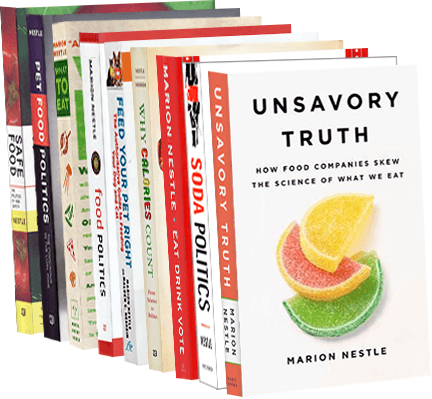 As Center for Science in the Public Interest (CSPI) points out, is this something we need? While the FDA is busy investigating deaths linked (although not conclusively) to caffeinated energy drinks, CSPI has alerted the agency to the increasingly widespread addition of caffeine to foods. The gum contains 40 milligrams of caffeine per piece, with 8 pieces per box. Forty milligrams isn’t much but look what else is caffeinated these days: Frito Lay’s Cracker Jack’d snack, Kraft’s MiO Energy water enhancer, and jelly beans, waffles, maple syrup, popcorn, and beef jerky. These are in addition to the usual sources of caffeine: coffee, tea, and cola drinks. Most people can manage small amounts of caffeine without sleep interruptions, but larger amounts are a worry. Pediatricians discourage use of caffeine by children and adolescents who are highly sensitive to its effects: restlessness, irritability, insomnia, and sometimes worse. Now, the company is pushing caffeinated gum…. Anything to sell chewing gum, I guess. I am an avid follower of NutraIngredients-USA.com, a daily newsletter for the food industry. Today, it collects its recent articles on energy drinks in one place. The makers of energy drinks have managed to get away with positioning these products as healthier alternatives to regular soft drinks. They also have gotten away with being able to add vitamins and minerals to them that the FDA would not permit in regular Coke or Pepsi. Unfortunately for them, some manufacturers upped the caffeine to the point where it might be making people sick. Illnesses among energy drink users have focused attention on these products. Are energy drinks the new frontier for food advocacy? I think so, and I’m guessing NutraIngredients-USA does too. People who consume caffeinated energy drinks may be dying right and left (Because of the caffeine? The drinks? Hard to say) but that isn’t stopping food manufacturers from adding it to everything: Cracker Jacks, jelly beans, Gummi Bears, brownies, mints, and maple syrup. The FDA has just released its data on problems reported among users of three caffeinated energy drinks. The three products involved in the release — Rockstar Energy, 5-Hour Energy and Monster Energy — are all marketed as dietary supplements. Other energy drinks like Red Bull, NOS and AMP are marketed by their producers as beverages. There is not a mandatory reporting requirement for beverages, though makers can do so voluntarily. …The records related to Monster Energy and 5-hour Energy came to light because they were released by the F.D.A. under the Freedom of Information Act. The choice of labeling these products as foods or supplements deserves scrutiny. By an act of Congress, dietary supplements do not have to meet the same standards for content and health claims as foods, and the FDA cannot do much to regulate them unless the products are demonstrably harmful. Even though people died after drinking these products does not necessarily mean that the products caused the deaths. Even this number of deaths could be a coincidence. Since 2009, 5-Hour Energy has been mentioned in some 90 filings with the F.D.A., including more than 30 that involved serious or life-threatening injuries like heart attacks, convulsions and, in one case, a spontaneous abortion…. Some lawmakers are calling on the F.D.A. to increase its regulation of the products and the New York State attorney general is investigating the practices of several producers. I looked up the Supplement Facts label for 5-Hour Energy. According to statements given to Beverage Daily, 5-Hour Energy says there isn’t any evidence that its products cause deaths. Its shots contain no more caffeine than a cup of coffee, and do not contain herbal ingredients. But the product label does not list caffeine content. The FDA does not require companies to disclose caffeine levels. It allows them to market the products as drinks or as dietary supplements. Monster Energy contains 240 mg caffeine in 24 ounces. It has been associated with the deaths of five people so far. The Times points out that healthy adults can consume large amounts of caffeine with no evidence of harm but that caffeine can be risky for people with underlying conditions like heart disorders. How much is risky? It’s hard to say. Most adults know how much caffeine they can handle without getting shaky or sleep-deprived. But kids don’t, necessarily. Consumer Reports tested products and found that some energy drinks contained more than 240 mg per serving, but notes that packages sometimes contain more than one serving. 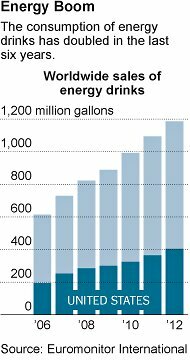 The Times notes that sales of energy drinks in the U.S. are booming, growing by about 16% last year and bringing in nearly $9 billion. What to do? A lawyer for the parent of one of the teenagers who died after drinking Monster Energy is urging the FDA to ban the drinks to minors. The FDA should investigate the cases, for sure. And how about adding amounts of caffeine to labels. That seems like a no brainer while the investigations are in progress. In 1994, Congress passed the Dietary Supplement Health and Education Act (DSHEA), which in essence deregulated dietary supplements, permitted them to be labeled and regulated as supplements, not foods, and removed much of FDA’s authority over their contents and health claims. Monster Energy drinks are labeled as supplements, removing them from much of FDA’s authority. But while the F.D.A. regularly makes adverse event reports about drugs and medical devices publicly available, it does not do so for dietary supplements like energy drinks. Because of that policy, consumers had no way of knowing of the complaints about Monster Energy drinks before incident reports were released by the F.D.A. in response to a formal Freedom of Information Act request. Caffeine levels per serving ranged from about 6 milligrams to 242 milligrams per serving—and some containers have more than one serving. The highest level was in 5-hour Energy Extra Strength; the lowest in the seemingly oxymoronic 5-hour Energy Decaf…By comparison, an 8-ounce cup of coffee has about 100 milligrams; a 16-ounce Starbucks Grande, 330 milligrams. Five of the 16 products that list a specific amount of caffeine…had more than 20 percent above their labeled amount on average in the samples we tested. On the other hand, one…had caffeine about 70 percent below the labeled amount. Consumer Reports points out that Monster drinks—like those of 16 other products—warn against use by children, pregnant or nursing women, and people sensitive to caffeine, and recommend a daily limit. Whether the Monster Energy drinks are really responsible for the reported deaths will not be easy to establish. One victim, age 14, is said to have consumed two 24-ounce Monster drinks containing 240 mg caffeine each within a day or two. That energy drinks are labeled as supplements ties the FDA’s hands in dealing with such products. Two Senators (Durban and Blumenthal)—not for the first time—are pushing the FDA to investigate. Good idea. I can only speculate about why the FDA isn’t responding, but I’m guessing that this issue, like so many others, is too controversial to take up during an election campaign.